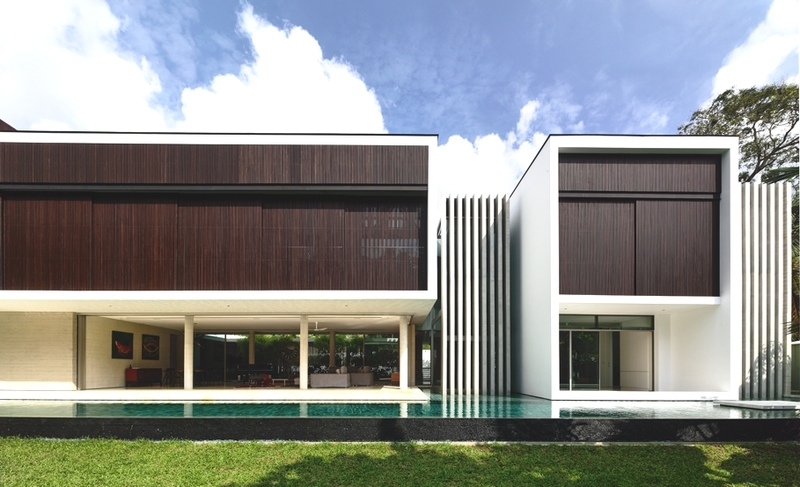 This was an ‘additions and alterations’ project on an existing house in Bukit Timah, said the architects. The owner’s father built the original house and the building was in an awkward position on the plot. According to the brief, the client wanted to have two master bedrooms along with four bedrooms – this would require additional floor area as the original house area could not comfortably fit in the extra rooms. 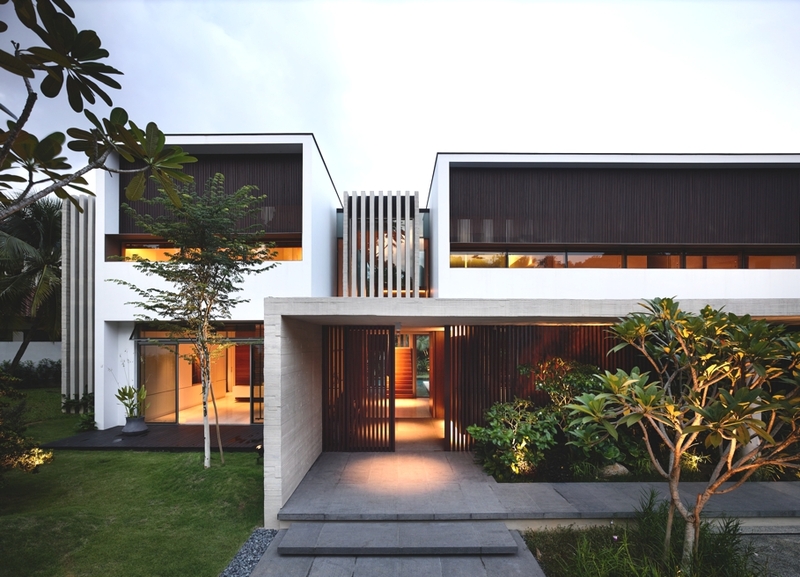 However, the architects resolved to make use of the existing structure and maintain its orientation by simply adding an additional volume to accommodate the extra bedrooms and en-suite bathrooms. The finished work is a successful amalgamation of the old house – with its 1950s look – and the new wing that closely follows the original structure whilst suitably updating it according to modern architectural trends. 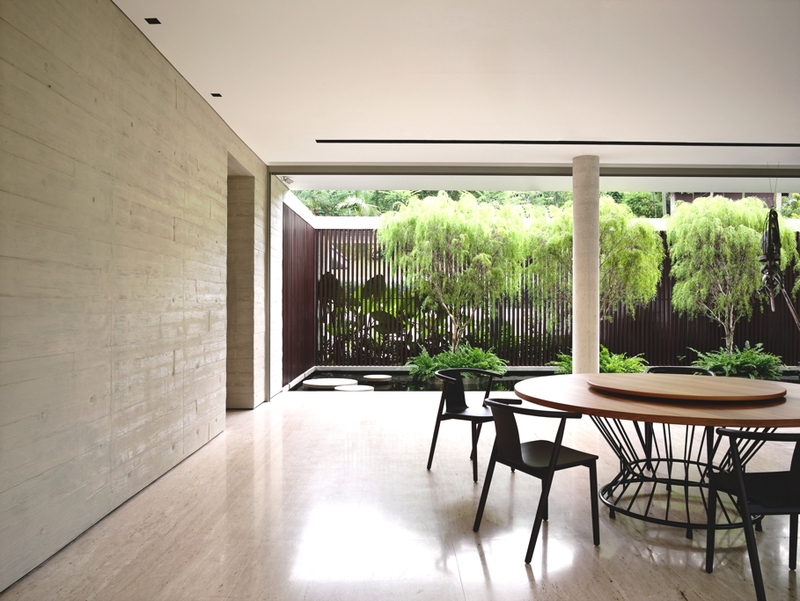 For example, a stonewall in the original house was replaced with a concrete wall to give it a more modern finish whilst still staying true to the spirit of the earlier design. Wherever possible, the original material was retained, such as the plaster that forms the upper levels. Also, the designers tried to maintain a similar look, so the new structure replicates the design of the old house by keeping the top volume bigger than the first floor, which is recessed. 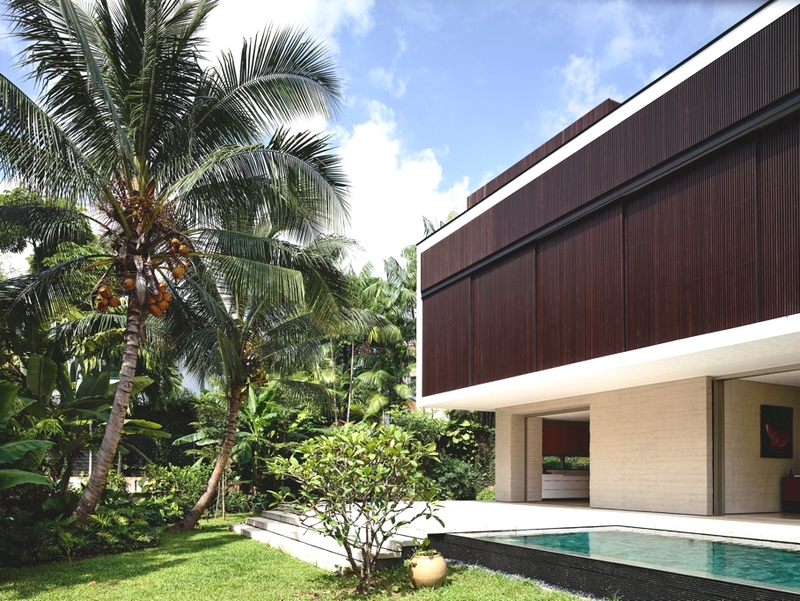 Visually, the modern house appears to be a new building, yet there are scattered elements that make the older house recognisable even within this newer build, and that was essentially what the client desired for his childhood home. Because of the scale of renovation work required, the internal layout of the original house was drastically altered, although the main entrance was kept in the same place. In the old layout, there was a five-step staircase leading down to a sunken living room and then up to the second floor. With the new layout, the living area was raised up to keep everything on the same level and the staircase was repositioned to the connecting lobby that now leads to the new wing. Located at the entrance, this lobby forms the connection between the new and old sections of the building and beautifully marries the two structures for a homogeneously modern look. Because of the flexibility of this design, the contemporary house can be made private or more open according to the owner’s needs. Another requirement from the client was that all social spaces be naturally ventilated. As such, the entire living and dining area has floor-to-ceiling glass windows that can be pulled back to create a completely open space that looks out into the pool and garden areas outside. The old kitchen was also demolished to allow the dining room to be extended while the remaining space was kept as the service volume. Meanwhile, the old guestroom was demolished to create the lower master bedroom with en-suite bathroom. 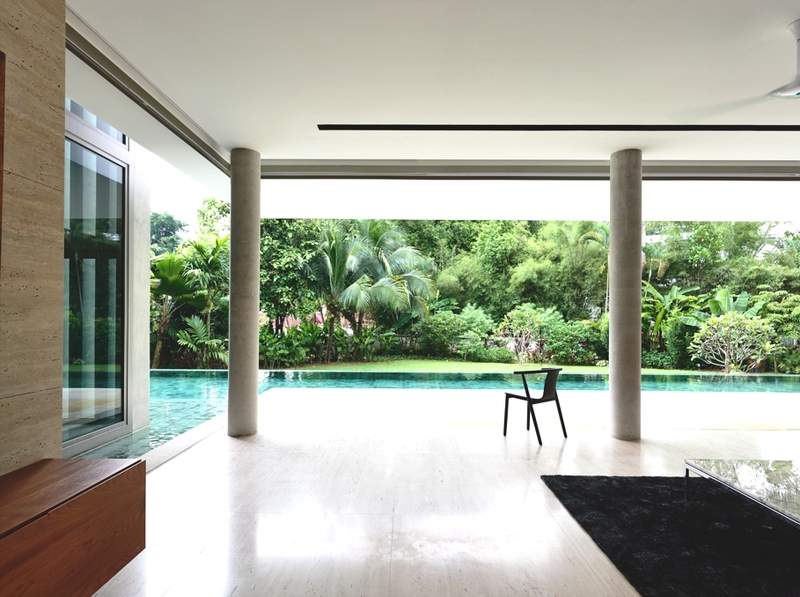 This room has a lounge area as well as an outside deck that overlooks the pool. 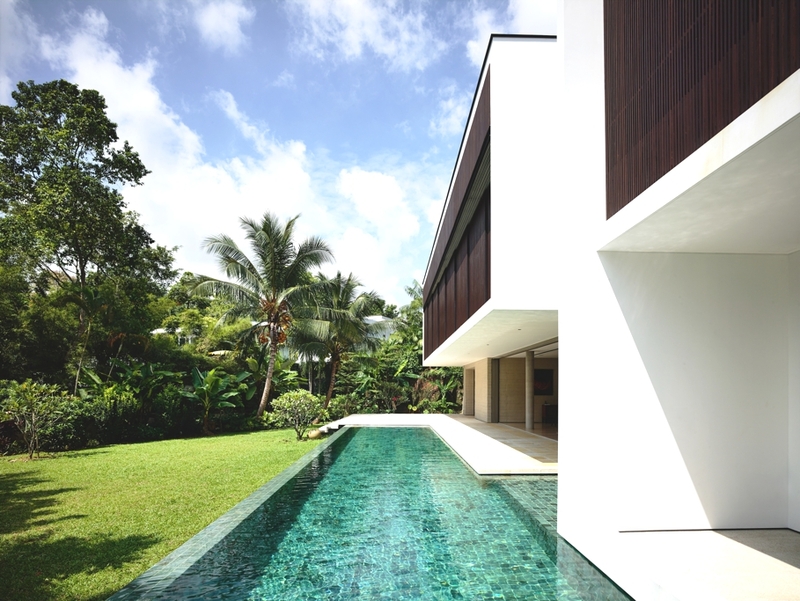 Aesthetically, the main volumes of the house appear to be floating on the surface of the pool, as a recess was created at the base of the first floor, making the house’s structure look lighter. The design also ensures that the service areas are hidden yet remain completely functional, and retain maximum comfort. To improve pedestrian access from street level, the original gated entrance was redesigned to have the sidewalk extended and an additional volume created. The shape of the additional structure conforms to the irregular geometry of that corner of the site. 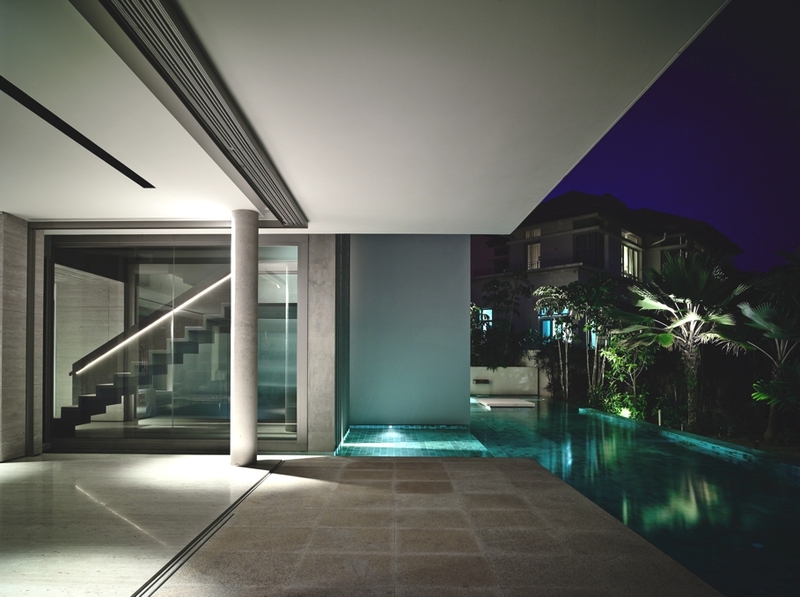 In the original layout, the second level had an unusually shaped outdoor pathway that connected the master bedroom with the rest of the bedrooms in the main building. Furthermore, the old staircase’s position limited the amount of space for the bedrooms, which were also irregularly shaped. Post-renovation, the pathway was replaced with a bridge while the removal of the old staircase allowed for the existing bedrooms to be made bigger. The bedrooms were also reshaped into more regular forms to maximise each room’s floor area. There are now three bedrooms, as well as a family room linked by a corridor. The upper master bedroom boasts an en-suite bathroom, walk-in wardrobe, and a balcony that looks out into the back garden. For his room, the client had also requested for a special desk to be built to form the backing of his bed, making it look like a bed board. From this desk, he could also enjoy views of the garden. The façade for the first floor volume is made from concrete while the second floor is in plaster. All the walls make use of plaster paint. 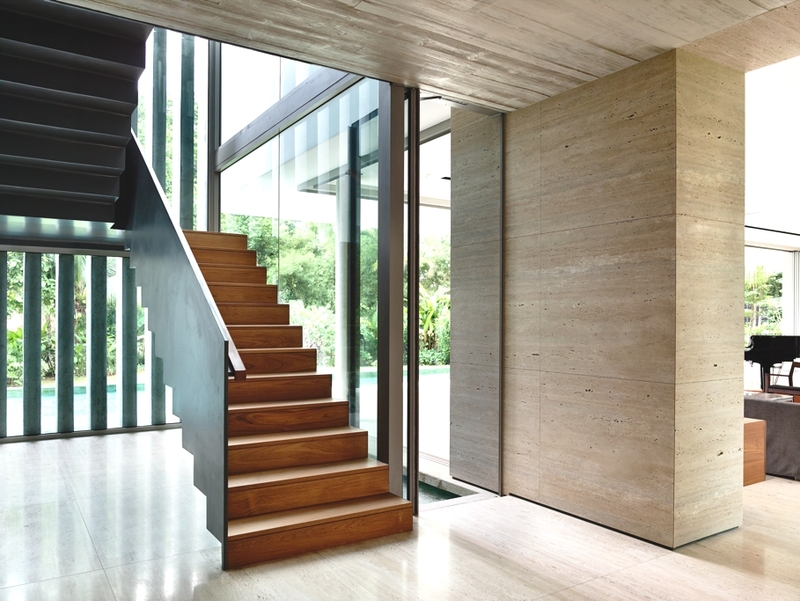 As for the flooring, the first level uses beige Travertine while the upper floor uses solid teak. 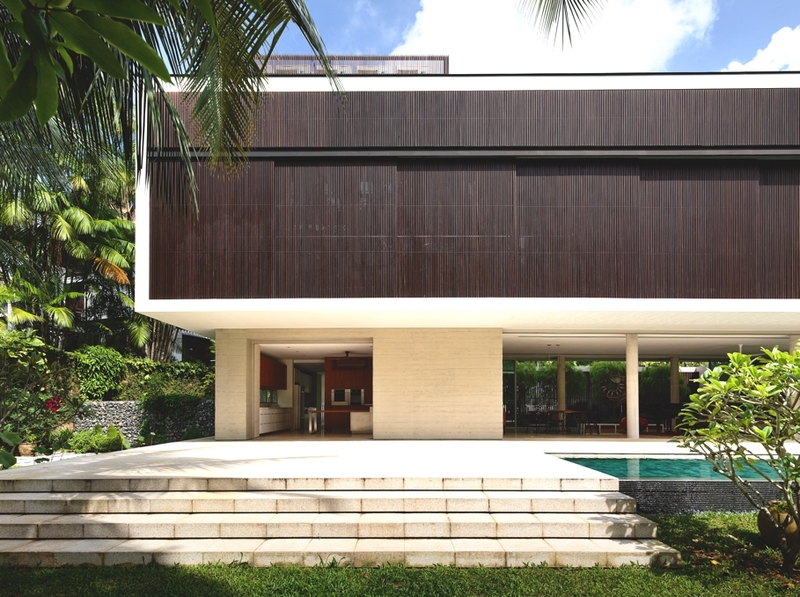 The main door is also made from solid teak. 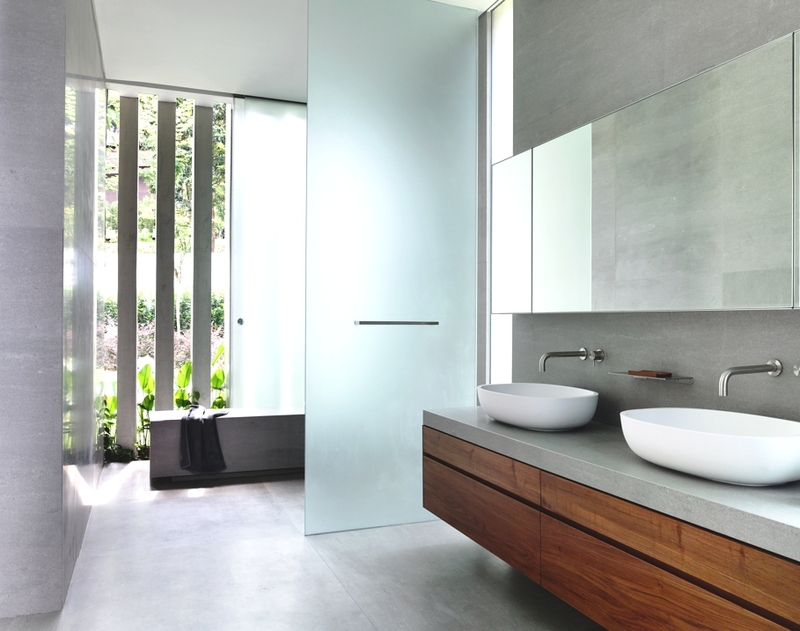 In the master bathrooms, pure grey marble was employed, while the rest of the bathroom floors make use of sandalwood mosaic. 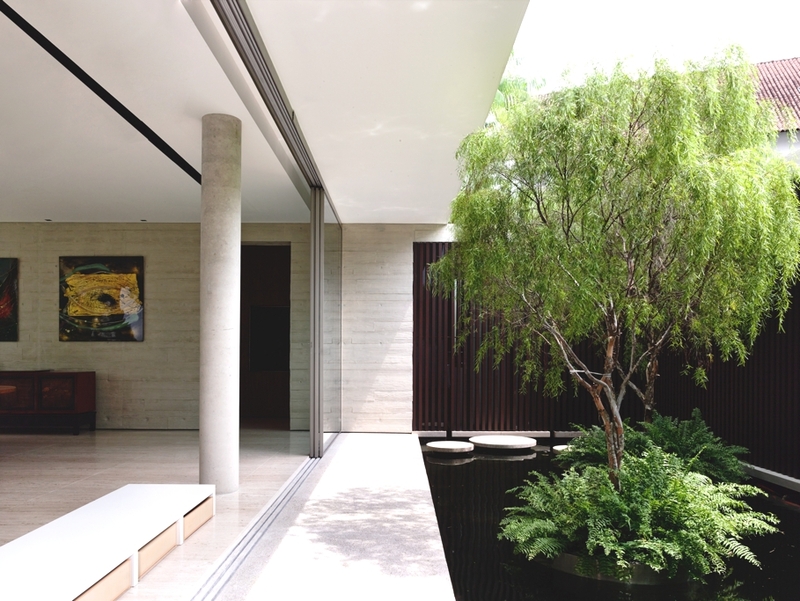 An open, cross-ventilation strategy was used in the layout of the house, allowing it to be naturally ventilated and illuminated throughout the day. 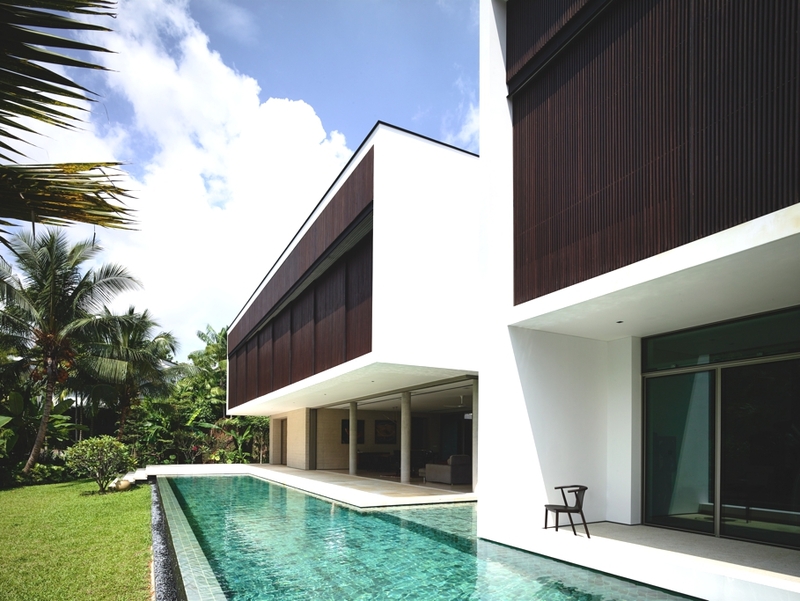 Louvers in the morning-sun-facing rear façade help to control the internal temperature, while a water feature at the front of the house also helps to cool the surrounding air before it enters the house. 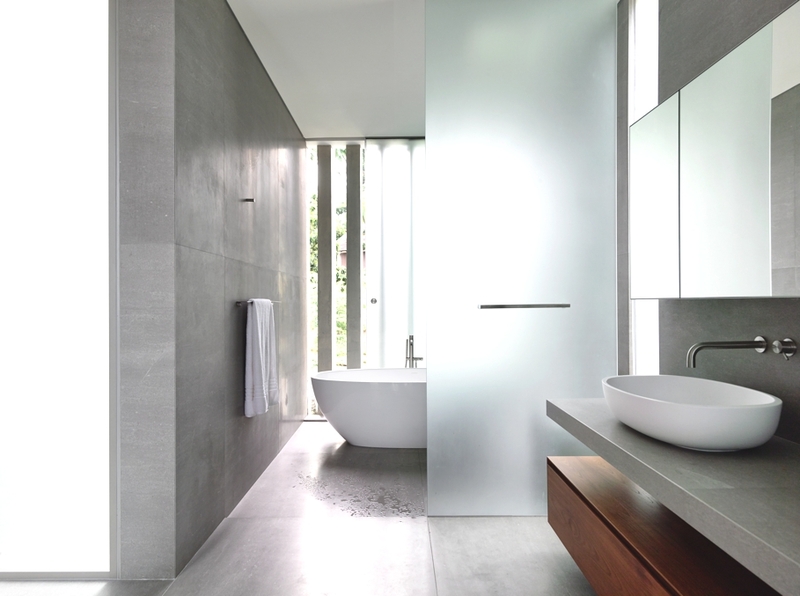 With this redesign, the quality of temperature and light control within the house was greatly improved. The client also wanted the existing gardens be preserved as much as possible, so very few of the original trees have been removed. 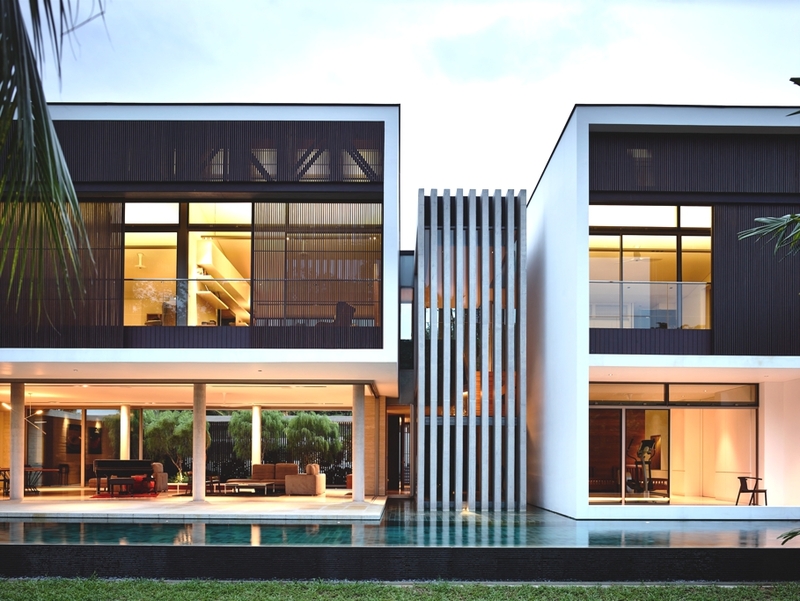 Melbourne-based architectural practice, FMD Architects, has designed the Bayside residence project. 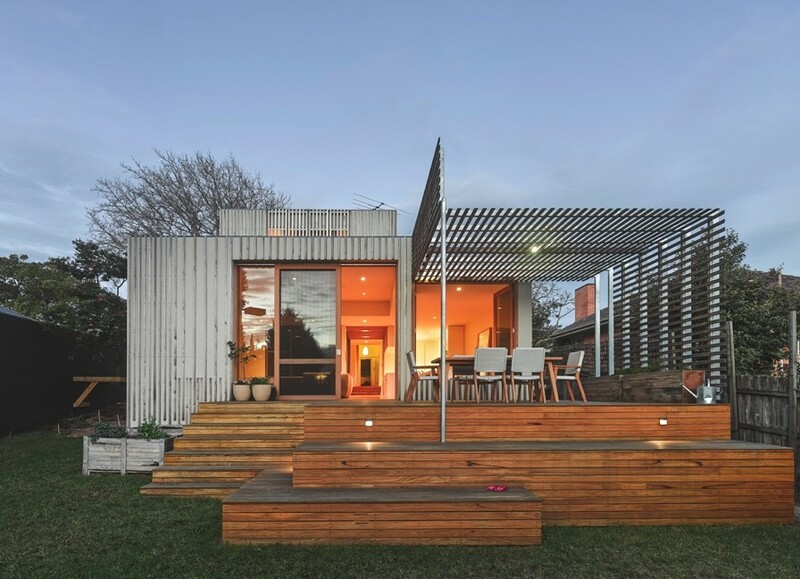 The single-storey art deco property is located in Brighton East, Victoria, Australia. 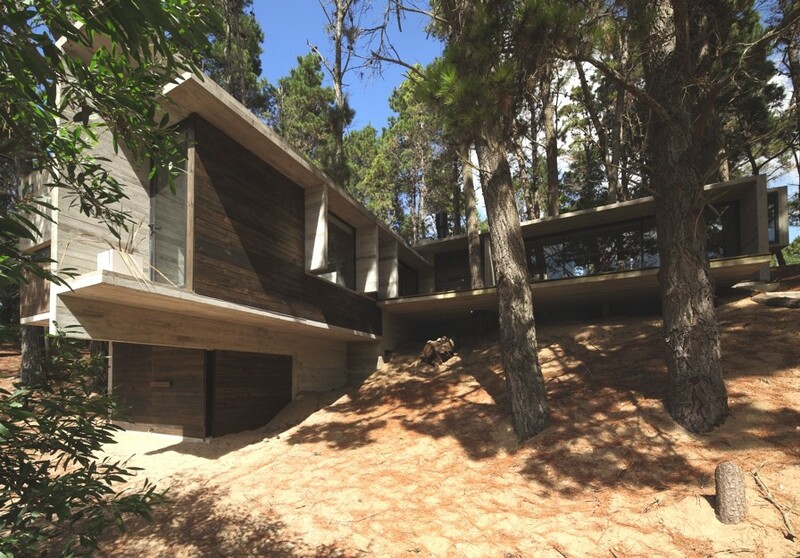 Casa BB is a 2011 project by Buenos Aires-based architectural practice Luciano Kruk. The three-bedroom holiday home can be found in Mar Azul, partido de Villa Gesell, Buenos Aires, Argentina.